Tt eSPORTS introduces CRONOS, a new gaming headset with a $59.99 MSRP. It starts shipping by mid-July. 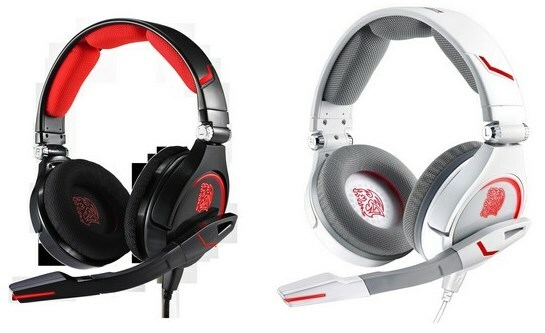 CRONOS, the “COMPUTEX d&i Awards 2013” winner, is an intricate blend of form and function, presenting strong gaming style, the Battle Dragon LED lighting on the earmuff adds more gaming element. It’s the first in the Tt eSPORTS lineup that’s both optimized for gaming and mobile use; the CRONOS comes with a set of removable cables for PC use as well as a set for mobile use. The LYCRA® head-pad design reduces the pressure on head with Hi-performance frequency response. Bendable and pivotable microphone boom to increase the sound quality and Microphone mute switch for controlling on the fly with 3.5mm gold-plated plug for smooth the signal and data transmission. An optimal gaming experience via USB plug and Black and Red cross braid cable for durable use and stylish which is focus on target group of Casual and competitive gaming enthusiasts.